Parade from about 1893 to 1906. 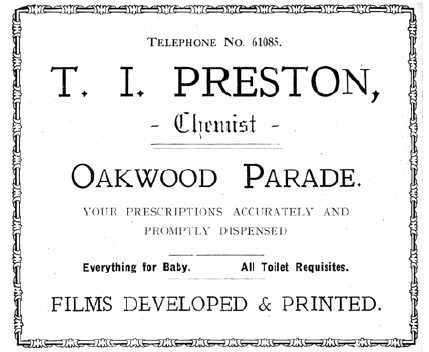 In Oak Leaves 13, I referred to ‘Preston’s Oakwood Parade’. In hindsight I realise this is misleading, as several people were involved in building the Parade. If one name has to be chosen ‘Hudson’s Oakwood Parade’ is more appropriate as will become apparent later. Facing up to my mistake has at least made me take a good look at the Parade and its origins. The result is the following note about the Oakwood Parade buildings fronting onto Roundhay Road on the Oakwood Lane side. The former Post Office building on the corner of Oakwood Lane replaced an earlier construction in 1883. From 1962 to 1991 it was a branch of Lloyd’s Bank and then William H. Brown Estate agents. The Indian restaurant, Nawaab Khan, next door, was a garage business for most of its time until quite recently. It was constructed in the 1920’s, well after the completion of the rest of the Parade. Reference will be made to it again in an important context later. The other buildings of the old Oakwood Parade which will be discussed in the following sections, from the Fish Bar at number 492, down to Rico’s restaurant at 450, Roundhay Road, For convenience, I will often refer to the buildings by the names of the current businesses on the ground floor and the address numbers in Roundhay Road. Also, I will sometimes refer to the ‘upper section’ (Oakwood Lane end) and the ‘lower section’ (Gipton Wood end) to distinguish between the two terraces of the Parade. Henry Hudson of ‘Oakwood’, senior partner in the firm of woollen manufacturers Hudson, Sykes and Bousfield, died in 1891. ’Oakwood’, now known as ’Oakwood House’, still exists, the old mansion of Sabourn Court BUPA homes for the elderly in Oakwood Lane. Henry predeceased his second wife, six sons and an unmarried daughter so it’s perhaps not surprising it was decided to put the whole estate up for sale. Early attempts to sell the upper part of the estate with Oakwood House and outbuildings seem to have been unsucessful and in the years following the Executors started to develop the lower section which they called ‘the Oakwood Park’, some 33,000 sq yards between Gipton Wood and Oakwood Lane and fronting onto the (then) Wetherby Road, or the ‘High Road’ as it was also known at that time. In 1895 Henry’s eldest son Henry Gowan Hudson died suddenly. His death necessitated a legal conveyance later that year which shows the progress the Hudsons had made. It is clear they were now not content just to sell off the land. They had a vision of high class houses and shops in their ‘Oakwood Building Estate’ as they called it, and there were Trustees to control the development. The 1895 conveyance contains a plan and on it there are only four residential shops of the new Oakwood Parade. A Trade Directory of 1894 shows they included a bakery and confectioner’s shop, a grocery and a butchers, a good mix to serve new housing developments which were taking place at Oakwood and other areas in Roundhay. The four buildings are shown in Fig. 1 as they are today. Fig. 1.The first four buildings to be built on the Oakwood Parade, circa 1893/94. Fig. 2. The lower section of the Parade viewed from the Gipton Wood end. 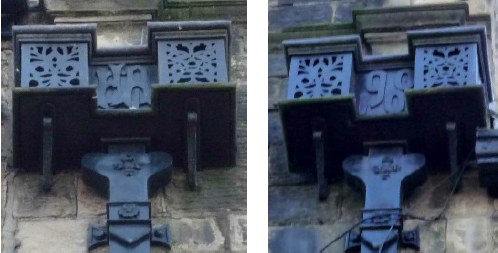 The fine ornate gables is a prominent feature which seems to have set the style for later buildings on the Parade, see Fig. 3. This was not an accident, surely. It is more likely to have been a deliberate choice in the architecture by the Hudsons to make them stand out as buildings of character. 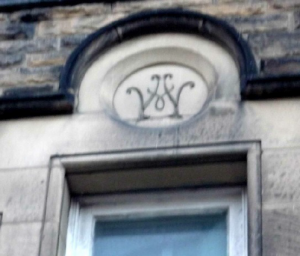 The indications are that these four buildings were built by the Hudsons. Certainly we know the first of these was, because it says so in the deed of conveyance. Also, a sales brochure of 1894 on behalf of the Hudsons, shows the third building for sale as lot 7, and so presumably it had been built by them. This early group of shops with houses and stables would have served as examples of the standard expected by the landowners for the future development. 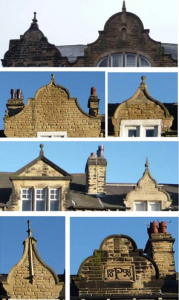 Ornate gables continued to be a feature on the frontages but a greater degree of freedom in the style seems to have crept in as the land was sold off and the building was continued by the new owners. 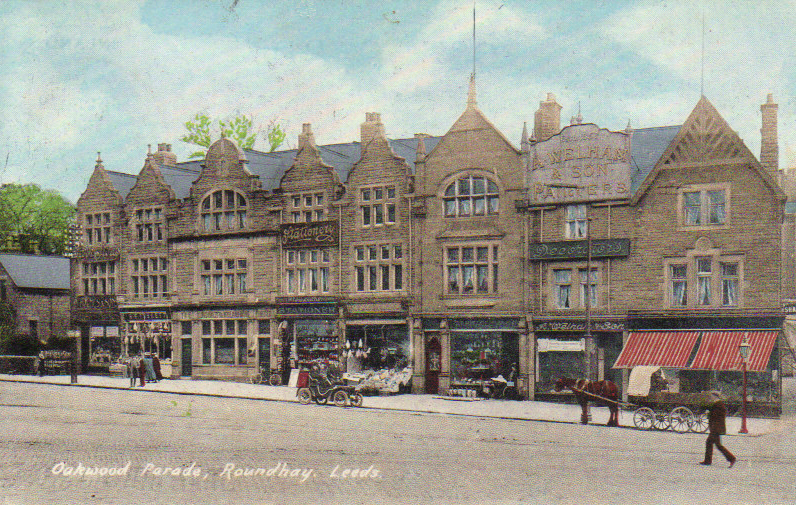 1900 when the last plot was sold where Rico’s restaurant stands today, number 450 Roundhay Road, although it was a few years later before this unusual building was erected. Towards the end of this activity, maybe in 1899 but certainly by 1900, a single shop was completed (currently the Tasty Cafe at 482 Roundhay Road) in the space between the old Post Office and the other shops. This was the beginning of the upper section of the Parade. 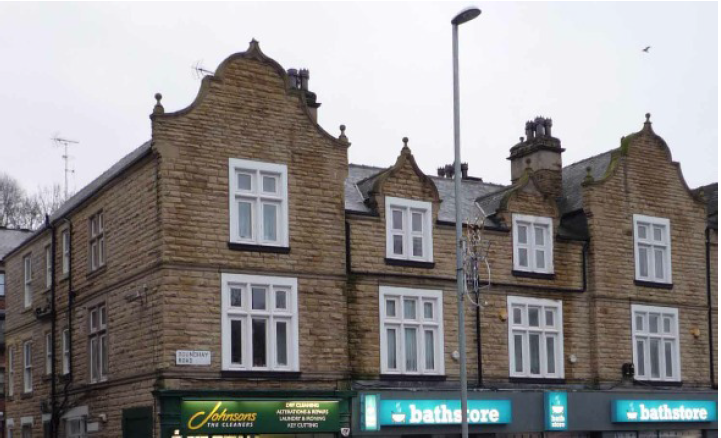 In 1901 a block of two buildings was added to it (currently Oakwood Travel and David James Interiors, numbers 480 and 478 Roundhay Road) with a gap between the top and lower sections giving access to a road at the rear (Back Oakwood Avenue). These two buildings are very different from the earlier shops, much plainer and more characteristic of many houses and other shops of this period (e.g. see Fig. 5 the shops on Street Lane which were just starting to be built). In the next few years, building was continued to complete this upper section of the Parade by the end of 1903. Ornate gables were again part of the designs, as if the Hudson Trustees had once again become involved. 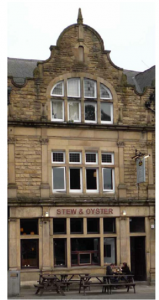 Arguably the most attractive frontage on the whole Parade was built during this period at 488 and 490 Roundhay Road, currently the Stew and Oyster public house, which was built for use as a bank and remained a bank until quite recently. More Information about the Shops, the Early Owners and Residents. I mentioned that the first shops on the Parade had a confectioner’s business. This was the end shop of the lower section (now Johnsons, number 476 Roundhay Road). When it was sold in 1894 the buildings, a house, shop and stable, were described in the deed of conveyance as ‘recently erected by the Vendors’, the Hudsons. The new owner was James Callagher, whose speciality seems to have been making muffins. It was not long before he was renting out the shop and bakehouse to Mrs Eliza Lambert and later he sold out to her in 1898. For a while prior to this, Eliza lived with her husband, William, and family, in one of the new houses on the Oakwood Building Estate, renting 21 Oakwood Avenue from the Hudsons on a yearly tenancy. In 1900 an advert in the paper by Hovis lists Eliza’s Oakwood Bakery as a place where daily-fresh Hovis bread could be bought. There was a newspaper report that the Lamberts had been fined for selling wine after ten o’clock at night (at twenty minutes to eleven!). The Lambert’s pleaded ignorance of the regulation. They could hardly deny the offence as a police constable was in the shop at the time when the two cups of wine were sold. The Lamberts continued with their confectioner’s shop at Oakwood until the 1920’s and they also opened another shop in Roman View off Street Lane. The land for the middle two shops in this group of four, (numbers 474 and 472 Roundhay Road, currently part of the Bathstore premises, was bought from the Hudsons in1898 by Fred Terry, a Scarbrough draper. 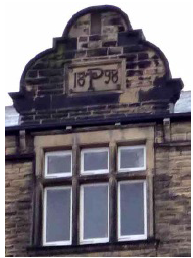 It seems he leased the land for number 472, to William Henry Gilpin (who was also leasing Roundhay Park Mansion from Leeds Corporation) to build a butcher’s shop and house, and a stable there, before selling the land to him in 1900. I imagine the shop next to this, number 474, was built about this time too but I have no details of by whom. Fred Terry rented it out at least in its early years to James Smith and Sons, dyers and cleaners. The last of this group of four buildings, number 470a, was opened as a grocer’s shop by Joseph Staines in April 1894. Both land and buildings were conveyed to Staines earlier that year. The plot for the next building, number 490, was sold by the Hudsons to Joseph Staines in 1898 before he built on it a year or so later. These two shops remained in business, the Oakwood Stores of Staines and Son, Ltd., grocers, tea, coffee, wine and spirit importers, until the late 1970s. 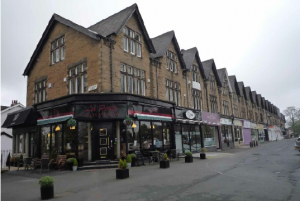 Next to this is the shop at 468 Roundhay Road, which has recently become the elegant trendy bar, now firmly identified with its origins in the new name ‘Preston’. It stands out with the gable inscription ‘18TP98’ and the beautiful mosaic floor outside the the shop door (See Fig. 6). The adjacent building, currently housing the City Stationer’s business, is very similar and the two look like a pair. 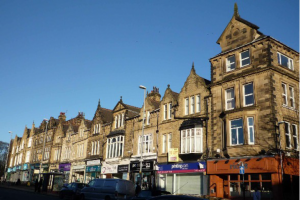 Indeed information from the West Yorkshire Archive Service (WYAS) refers to two shops and houses belonging to the executors of T. Preston in 1906. 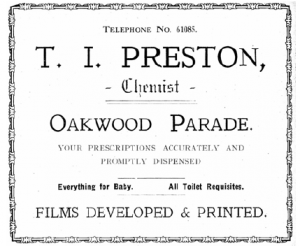 Census and trade Directories show Thomas Issott Preston, born in Chapel Allerton, lived here above his chemist’s shop for over thirty years from the beginning of the last century (See Fig. 7. Advert in 1930). His father Thomas Preston, died in 1902 and left a lot of money (some £11,000) so it seems that the Preston and City Stationers’ buildings were built for Thomas Preston and that the letters ‘18TP98’ are a memorial to him rather than his son. 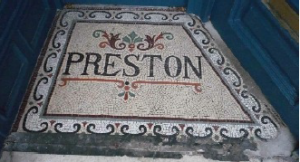 A few generations of this Preston family were grocers in Chapel Allerton. They were one of the most respected and educated families there, on a social par with the Nicholsons, who lived in Chapel Allerton before their more affluent days at Roundhay Park. Members of both families served as rate collectors and overseers of the highways for the township. Thomas Preston, married Sarah Issott whose parents had a grocer’s shop in Briggate in the centre of Leeds and her brother Joseph Issott was a grocer too in his turn. Thomas and Sarah’s son, Thomas Issott Preston, didn’t become a grocer, though. He served his apprenticeship in Kensington before he became a pharmacist on the Oakwood Parade and he also had a shop in Street Lane. Continuing on beyond the City Stationers, there is another clear block of four buildings, numbers 464, 462, 460 and 458 (currently Taylor-Jones, Cassini Properties, St George’s Crypt Shop and The Health Store businesses, respectively). These were probably built by Fred Fornsworth of Roland House, Wetherby Road. The land for the first three of this group was sold to him by the Hudsons in 1898. A few months later Wlliam Henry Gilpin bought the adjacent plot from the Hudsons and sold it to Fornsworth in 1900. The 1901 census shows a group of four buildings that were not occupied which may have been these, possibly recently built. Fred Fornsworth and his wife had several daughters. They had a son called Roland who died as an infant, which probably explains the name of the house on Wetherby Road. Indeed, Fred died in a house in Chapeltown which he also called Roland House. The next three buildings of the Parade, numbers 456,454 and 452 (currently Simon Falk eyecare, PCI Computers and Bang & Olufsen) are separate buildings. It seems they were occupied at the time of the 1901 census so they may have been built about this time or even a little earlier. A plan of 1904 shows all the buildings of the lower section of the Parade except for the last one (number 450, currently Rico’s restaurant) which is marked ‘to be erected.’ It was called the Oakwood Offices in 1906 by the owner, Herbert Havelock Hodgson. His name did not make the trade directories that year, so 1906 may have been the year that number 450 Roundhay Road was completed. Herbert Havelock Hodgson was interviewed during the inquiry leading to Roundhay’s inclusion into Leeds City in 1912. He was an estate agent but he also had several public roles. At the inquiry he stated that he had been the Highway Surveyor, Sanitary Inspector, Building Inspector and Assistant Overseer for the Parish of Roundhay since 1880 and he was also the Clerk to the Roundhay Parish Council. 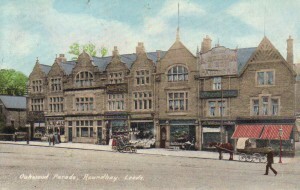 Roundhay Road, i.e. currently ‘Oakwood Travel’ and ‘David James Interiors’, respectively. They were submitted by Arthur Wilkinson, and stamped ‘approved’ in March 1901. Arthur chose the end building for his drapery and dressmaker’s shop (now ‘David James Interiors’ at number 478). I wonder how many of us have noticed his initials ‘AW’ (the ‘A’ is in the centre of the ‘W’) in the stonework above the first floor windows (see Fig. 8). 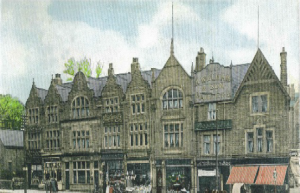 Wilkinson’s plans show the building adjacent to the two of his application (number 482 Roundhay Road, currently the ‘Tasty Cafe’) belonged to F. L. Armitage. ‘1900’ between the other set on the RHS (see Fig. 9). Fig. 9. These header tanks and fall-pipes used to be at 482, Roundhay Road, currently Tasty Cafe. They were recently taken down by the owner of the building.This seems to suggest that plumber and gasfitter, Frederick Lincoln Armitage, built this building, the first on the upper section of the Parade, in 1900, but a trade directory shows he was in business here in 1899 so maybe this was the year it was completed. The remaining five buildings of the Parade towards Oakwood Lane, were built in 1903 jointly by Fred Fornsworth and by Cornelius Griffin, the proprieter of the Dolphin Hotel in Vicar Lane. Both men established themselves in the boot and shoe making industry in their younger days and were pobably well-known to each other. 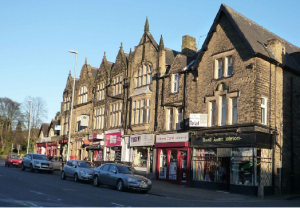 Fred Fornsworth built the two buildings on the remaining end of the Parade, numbers 494 and 492 Roundhay Road. The latter is currently the Fish Bar. Number 494 no longer exists. It seems to have been demolished in the 1960s (See Figs. 10 and 11). 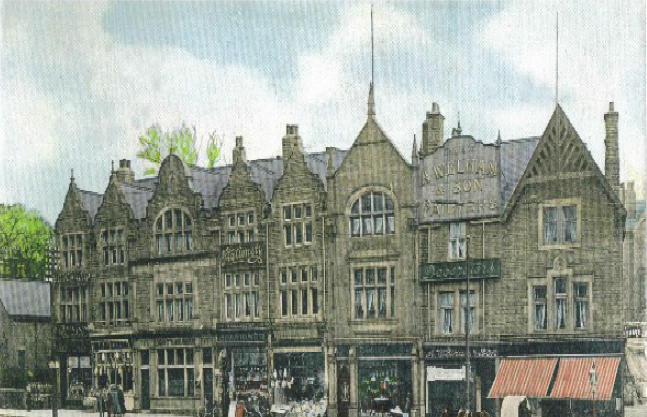 Griffin sold it to David Holmes for a grocer’s shop soon after it was built in 1903. Today the Stew and Oyster premises, numbers 488 and 490 (See Fig. 12), was built by Fred Fornsworth for a branch of the London City and Midland Bank. During its construction in 1903 he bought a strip of land from Cornelius Griffin’s adjacent plot to enlarge the bank. Fig. 12 The Stew and Oyster building. Built as a branch of the London City and Midland Bank Ltd. in 1903. It remained a bank for over a century.